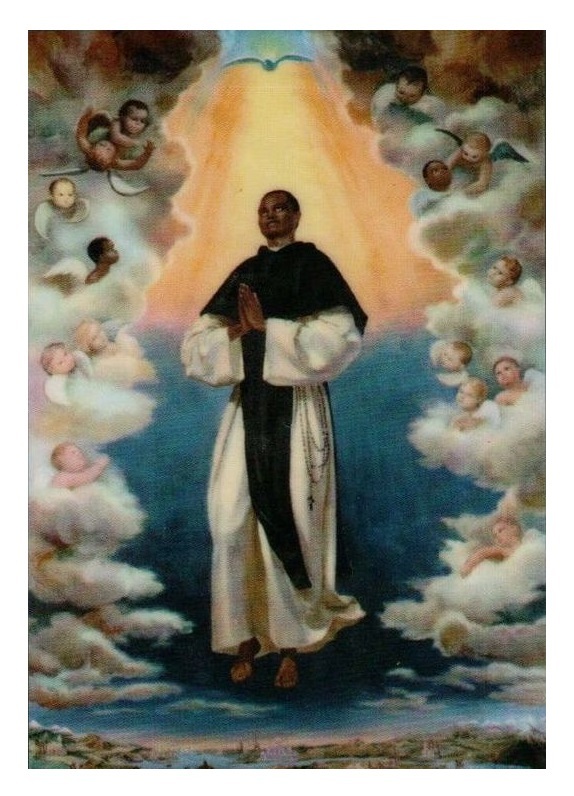 St. Martín de Porres (Lima, 1579 -1639) known as « Martin of Charity », was a Peruvian lay brother of the Dominican Order, first saint mulatto of South America. 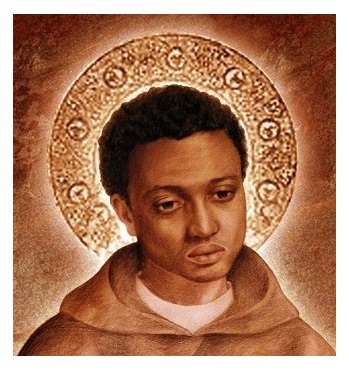 He is the patron saint of interracial harmony, known for his vegetarian lifestyle, social work and miraculous healing powers. Among the many miracles attributed to Saint Martin were levitation, bi-location, miraculous knowledge, instantaneous cures, and an ability to communicate with animals. He is also known as « the saint of the broom » because he is often pictured holding a broom, as a representation of his humility and the way he dedicated himself with love to even the most menial of tasks. He was born 1579, in Lima, Peru, son of a Spanish nobleman and soldier, Juan de Porres, from Alcántara, and of a black freed Panamanian slave, Ana Velásquez. Therefore, he was of a mixed racial identity. 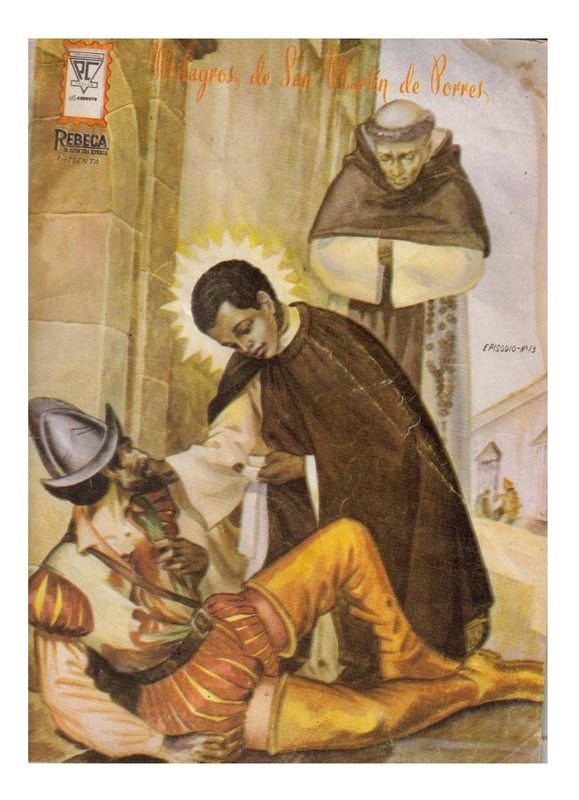 Martin de Porres was baptized on December 9, 1579 in the Church of Saint Sebastian of Lima, in the one that seven years later, Santa Rosa of Lima would be baptized too. He had a sister named Juana, born two years later in 1581. After the birth of his sister, the father abandoned the family to work abroad. They ended up living in the poorest part of Lima. Martin and his sister grew up in poverty; his mother earned a small income taking in washing. Little Martin often came back from the market without the money which had been confided to him, and without the demanded reserves, having met on his way very numerous poor people who lived in the streets of Lima at that time, and having distributed them his flat purchases. His father returned when Martin was about 8 years old and took responsibility for getting his children into a better life. He arranged to have Martin and his sister get four years of schooling in Guayaquil, Ecuador. Martin was confirmed by the Archbishop Toribio de Mogrovejo (1538-1606), who would later be canonized a saint. After that, when Martin was 12 years old, he was sent to work with a barber-surgeon in Lima from whom he learned some medical knowledge and insights into the care of the sick. And his sister stayed with an aunt in Guayaquil. Martin was an attentive and devoted apprentice. The sick came rather towards him both for his sweetness as for its skills which were already big. 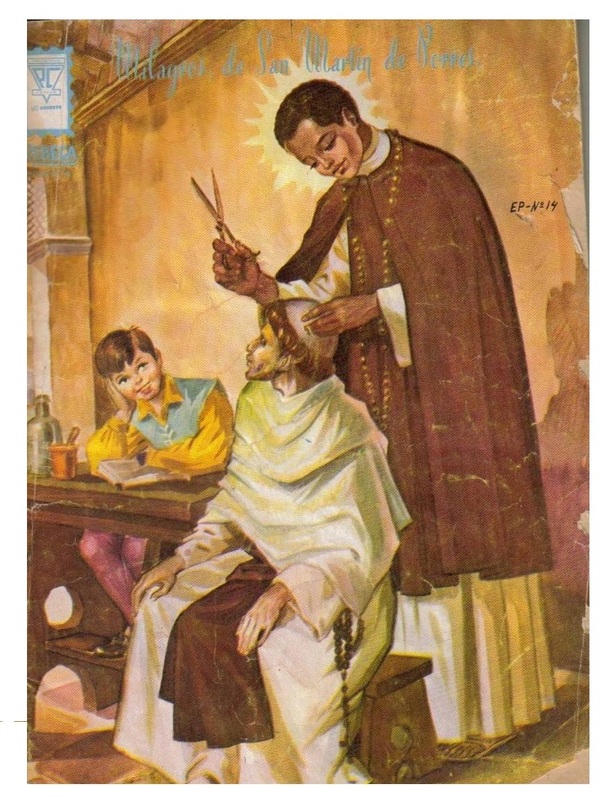 At age 15, Martin completed his work with the barber-surgeon and became a servant in the Dominican Convent of the Holy Rosary, which had been recently established. 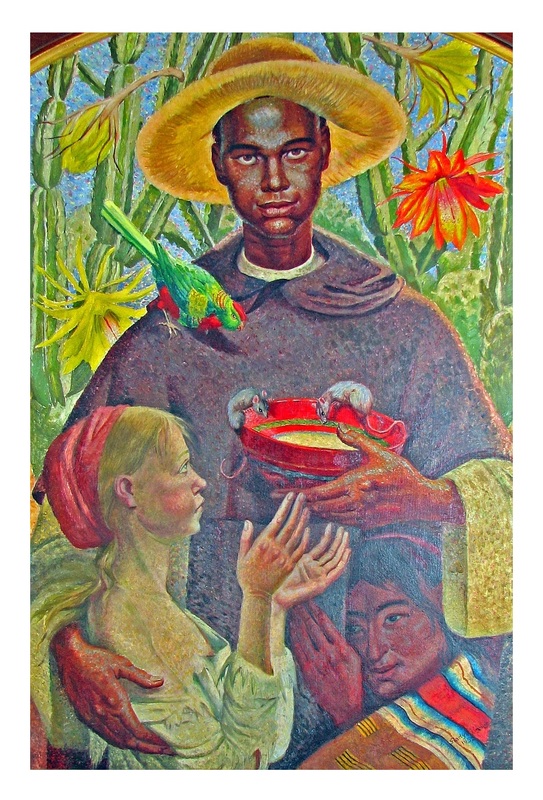 Although Indians, blacks and their descendants were barred from becoming religious, Martin was accepted by the Dominicans as a «donado». A lay person allowed to live with the community and wear the habit in return for performing menial tasks. 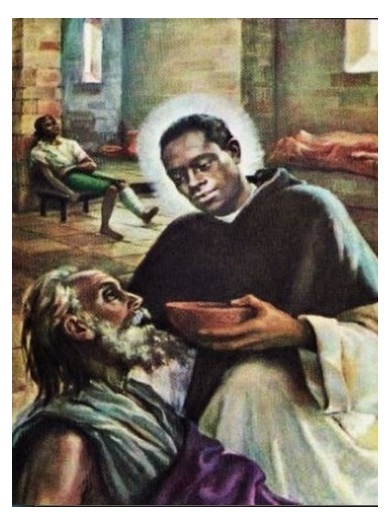 He made all these tasks with enjoyment and humility; he was also assigned for the care of the sick to the infirmary, which he fulfilled dedicatedly and with big success. He lived nine years in this way, practising the humblest offices. It was admitted as brother of the order in 1603. He persevered in his vocation in spite of his father’s opposition and, in 1606, he turned into friar practising the votes of poverty, chastity and obedience. Martin worked a lot. 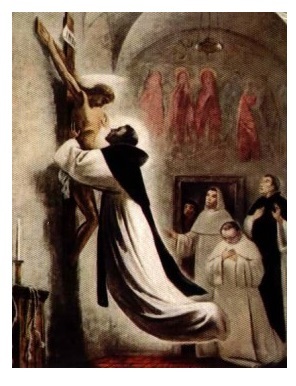 He had a profound devotion : he got up very early in the morning to go to the church to serve mass, and after his work, he locked itself into his room to pray, eyes fixed to the crucifix, and to read the pious books. Because of his diligent work, Martin was promoted to alms collector : he begged from the rich to support the poor and sick of Lima. Certain supernatural cures were attributed to him by his brothers who recognized him the gift of thaumaturgy. « I have to take a better care of this one, because he knows me better than the others ». But Martin had such gifts of healing that he soon had a reputation as miracle-worker. Also in distributing food from the convent to the poor, the food seemed to multiply miraculously. Because of his prior background with the barber-surgeon and his obvious interest in helping the sick, Martin was placed in charge of the Dominican's infirmary when he was 24; there his reputation for tender care of the sick grew. The Dominicans were so impressed that they also dropped the former opposition, based on his race, and he became a Dominican tertiary. Because he was such a wonderful man who was able to cure so many of the sick, that racial limitations ceased to exist. Brother Martin, in spite of his multiple occupations, used to assemble some working young persons of the monastery to instruct them and to speak to them about the Gospel. 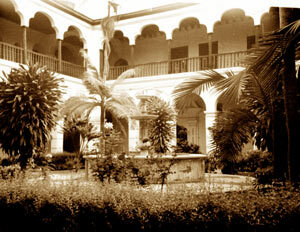 Out of the convent, in the city of Lima, many orphans were wandering, without family and without education. Martin worked very hard at the foundation of the orphanage of the Santa Cruz that has the vocation of gathering these children and of educating them. He was very careful in the choice of teachers and other employees, in order to offer studies for the later children’s life establishment with solid and Christian formation. 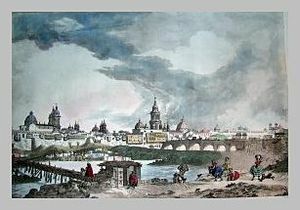 To finance his projects, Martin did not hesitate to request the great men of the city, and these were so much generous as his Faith and his Will were big. At the end of the meal, Martin used to collect non consumed food to distribute to the poor people who waited for it. « Can God, in his infinite Mercy, multiply this food, and the poor people will never lack to be served ». Martin continued to transport the sick to the monastery until the provincial Superior, alarmed by the contagion threatening the monks, forbade him to continue to do so. His sister, who lived in the city, offered her house to lodge those whom the small monastery could not hold. He made long penances, praying for the souls of the Purgatory, being whipped by the other monks in sign of humility. He wore a hair shirt and often fasted. He went up to the end of his vow of poverty. « When I wash my dress, my tunic is enough for me during the time it dries; and when I wash my tunic, it is my dress that I wear. That would really be superfluous to have two clothes in my use ». Also, he preferred old shoes to new ones. 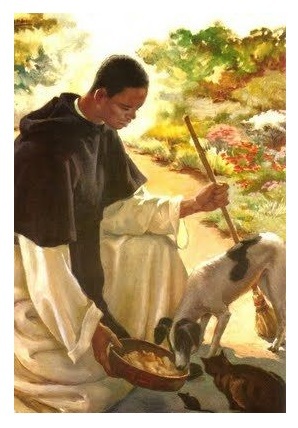 St. Martin could well be called the « St. Francis of Assisi of the Dominican Order » for his love of animals. He even set up a shelter for the stray cats and dogs and nursed them back to health. Thus, he is also often shown with one or more animals at his side. The story of his relocation of a large number of destructive mice, while incredible, is regarded as true. Recognizing the havoc the rodents were causing, Martin was seen escorting an orderly line-up of several hundred mice out of the convent and into the garden where they were promised a daily feeding by their kind hearted benefactor. Martin loved animals and he cared for sick and stray animals with the same tenderness and reverence with which he treated his human charges. He used to give eating all the animals of the monastery. In the same mess tin where turkeys, mice and cats ate together under his look. Among the many miracles attributed to Saint Martin were levitation, bi-location (being in two places at one time), miraculous knowledge, instantaneous cures, and an ability to communicate with animals. He soon became known in Lima not only for his caring attitude and willingness to do whatever work was needed (he is often shown with a broom because of this), but also for his spectacular cures, which were likely the result of his spiritual progress more than specific medical knowledge. Martin was a very spiritual man, spending time in prayer, sometimes surrounded by a brilliant light, and doing severe penance several times a day. There are many recorded instances of when his brother monks found him in the chapel before the Blessed Sacrament so filled with love for Jesus that he levitated in pure ecstasy. In other instances, Martin was able to bi-locate, and pass through locked doors in order to help a sick or dying person in another part of the monastery. He was able to know if the person in his care would or would not recover. Also, he had the gift of clear-sightedness. Before becoming a monk, Martin expressed the desire to become a missionary, but he never left his native city. However, even during his lifetime he was reportedly seen elsewhere, in regions as far distant as Africa, China, Japan, Mexico and the Philippines. He also had the gift of healing. Between many testimonies, the most extraordinary is the healing of terminally ills. « I treat you, God cures you », this was the phrase that he used to say to avoid that people adore him. In January of 1639 when Martin was sixty, he became very ill with chills, fevers, tremors and agonizing pain. He had several bouts of illness throughout the year and told his fellow monks that this would be his last illness. When death was imminent, he asked for Viaticum and the Last Sacraments. As the Salve Regina was sung and the Creed intoned, the crucifix which Martin had been holding slipped out of his hands and his soul departed his body. It was around 9:00 P.M., November 3, 1639, in the Rosary Priory. At present his remains rest in the Basilica and Monastery of Saint Domingo of Lima, close to the remains of Saint Rosa of Lima and Saint Juan Macías in the called « Altar of the Peruvian Saints ». 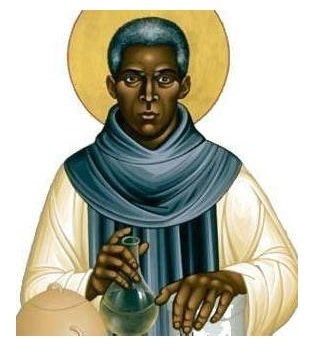 Martin de Porres was Beatified on October 29th, 1837 by Pope Gregory XVI. He was Canonized on May 16th, 1962 by Pope John XXIII. His Holiday was fixed on November 3rd. « Saint Martin, always obedient and inspired by his Divine Teacher, dealt with his brothers and with that profound love which comes from pure faith and humility of spirit. He loved men and because he honestly looked on them as God's children and as his own brothers and sisters. Such was his humility that he loved them even more than himself, and considered them to be better and more righteous than he was. He did not blame others for their shortcomings. Certain that he deserved more severe punishment for his sins than others did, he would overlook their worst offenses. 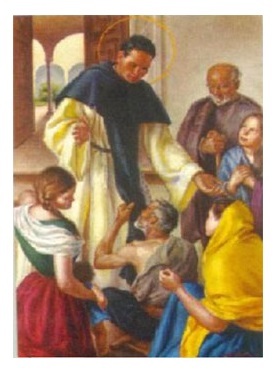 Brother Martin de Porres, in his life and after his death, made miracles by thousands. He made miracles as easily as others can make poems. And they say that the mason remained in levitation whereas he waited for the return of brother Martin. 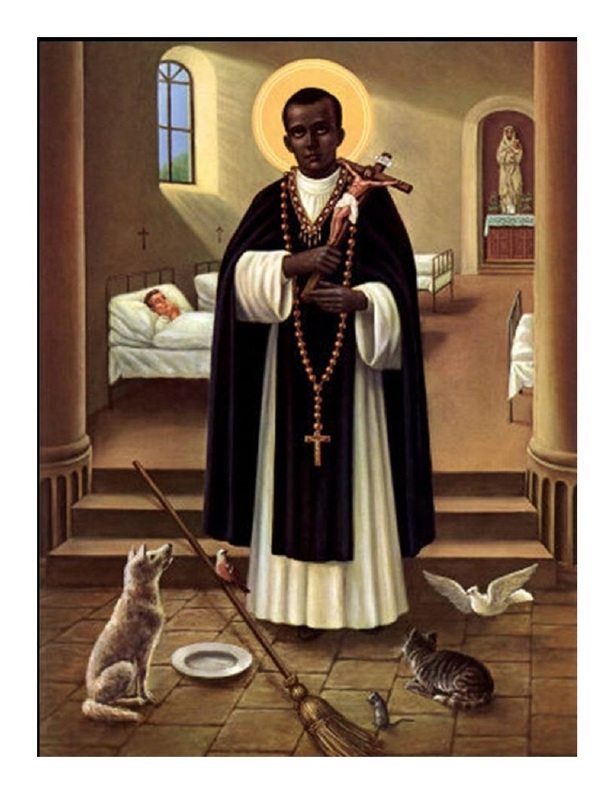 Fray Martin de Porres had a special predilection for little mice, uncomfortable guests who almost arrived with the conquest. Until 1552 these little creatures were unknown in Peru. They came from Spain in one of these cargo ships. 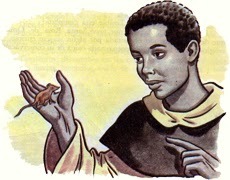 When our friar worked as nurse in the monastery, mice roamed as moros without master in cells, kitchen and refectory. Cats were known in Peru since 1537, so it was rare to see them in the city. In the time that Martin was a barber in the convent, a mouse was still almost a curiosity because the mice family was relatively beginning to multiply. The friars bored by the invasion of rodents invented many kinds of traps to hunt them, which very rarely succeeded. The ambassador complied with the embassy. And since that moment the mousy muchitanga left cloister and moved to the garden. Of course Fray Martin visited them every morning, carrying a provisions basket, and then the mice came as we made jingle bells. He kept in his cell, our good frier, a dog and a cat, and he had achieved that both animals were living in fraternal harmony. And therefore, they ate together in the same bowl or dish. And the mouse without getting pray, accepted the invitation. 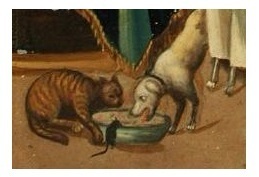 Since that day ate in the same dish : mouse, dog and cat. The faces of 2 Peruvian Saints, St Rosa of Lima and St Martin of Porres, as well as of the Spanish, St Juan Macías, have been reconstructed by Brazilian and Peruvian specialists, in February 2016, November 2015 and September 2015, respectively. The team of specialists began with the exhumation of the osseous remains of the saints deceased more than 300 years ago, which were in the Convent of Santo Domingo of Lima, to realize odontologic, anthropologic and forensic analysis. Then, they proceeded to the printing of the saints’s skull with the 3D technology. The final phase consisted of the exhibition of the busts. Scientists from the Universities of Saint Martin de Porres and from Inca Garcilaso de la Vega, in Peru and the Brazilian Anthropological and Dental Legal Forensics Team (Ebrafol) took part in this project . 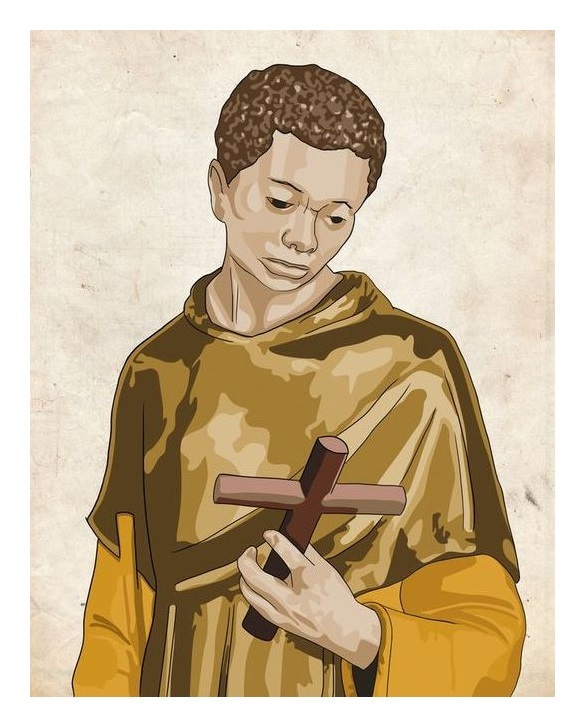 - Biography of St Martin de Porres - en.wikipedia.org. 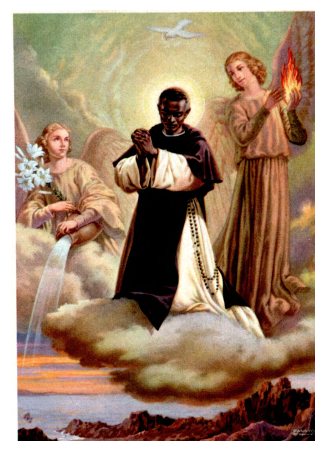 - From a homily given at the canonization of Saint Martin de Porres by Pope John XXIII - liturgies.net. - Reconstructed face of St. John Macias - commons. wikimedia.org. 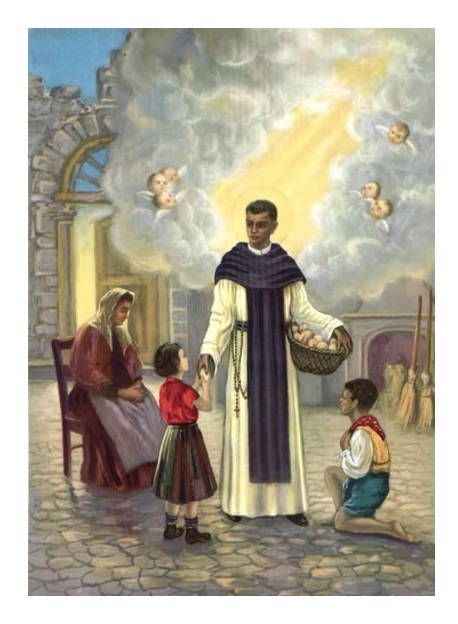 - Why Did Saint Martin De Porres Become a Saint ? - biography.yourdictionary.com.